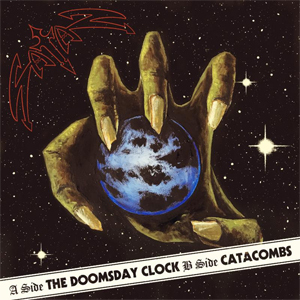 SATAN Release New 7" Single "The Doomsday Clock"
On July 6th, Metal Blade Records will release "The Doomsday Clock" 7" single on vinyl as well as digital. The b-side features another new track, "Catacombs", exclusively to this 7". Check out a teaser of "The Doomsday Clock" below. Having reunited in 2012 and returned to touring duty, SATAN - comprised of six-stringers Russ Tippins and Steve Ramsey, bassist Graeme English, drummer Sean Taylor and vocalist Brian Ross - once more proved their collective mettle with 2013's Life Sentence and follow-up Atom By Atom, both records critically acclaimed and maintaining the high standards of their earlier releases. With such a powerful collection in their hands, the band was unsurprisingly eager to take it on the road, and they once again had successful tours and festival runs in Europe, North America and South America, culminating with a slot opening for PENTAGRAM in Helsinki, which Tippins counts as a true honor. SATAN will unleash their latest batch of classic heavy metal songs in the second half of 2018. Be prepared for one of the best metal albums of the year and stay tuned for more information about it!